Lanark's first poorhouse was at the west side of Broomgate as shown on the 1858 map below. The L-shaped building had male wards at the north, and female wards and kitchens to the south. By the 1890s, a new poorhouse had been erected at the east of the town at the north side of what is now Hyndford Road. The site location and layout are shown on the 1913 map below. A lodge stood at the south-west of the site which was entered from Home Street. 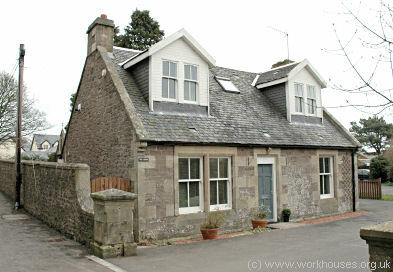 Lanark entrance lodge from the south-west, 2001. The large two-storey main block faced to the south. At its centre would probably have been the Governor's quarters with the dining-hall and kitchen behind. Separate male and female accommodation was provided at each side. 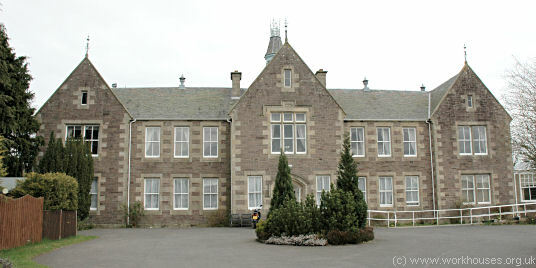 Lanark main block from the south, 2001. At the rear of the main building were various utility rooms and workshops, later extended northwards. Lanark from the north-west, 2001. A fever hospital was erected on an adjacent site to the north-east. Lanark fever hospital from the north-west, 2001. During the 1930s and 1940s, the former poorhouse operated as the Crosslaw Home Poor Law Institution whose provision included 28 beds for chronic sick cases. The former poorhouse building is now used as a residential care home. The fever hospital site is now occupied by Lockhart Hospital.